A gene on chromosome Xq12-q13.1 that encodes ectodysplasin A, a type-II membrane protein of the tumour necrosis factor family, which forms a homotrimeric molecule involved in cell-cell signalling during the development of ectodermal tissue. It can be cleaved by furin, resulting in a secreted form. EDA mutations cause anhidrotic ectodermal dysplasia (i.e., X-linked hypohidrotic ectodermal dysplasia). 1. Absence of a normal sense of pain. 2. The relief of pain, e.g. with medications such as anesthetic drugs. 3. The administration of a pain reliever. Spontaneous pain with loss of sensibility in a part. Analgesia to reduce the pain of childbirth. The anesthetic is injected continuously into the epidural space at the sacral hiatus. A technique of managing pain in which narcotics are infused into the peridural space through an indwelling catheter. Administration may be at a continuous basal infusion rate or self-administered within programmed limits. Epidurally administered medications diffuse across the dura mater, through the arachnoid and pia mater to provide pain relief, and are indicated to treat pain in the thoracic, lumbar, or sacral areas, e.g., in patients in labor or those undergoing thoracic surgeries, and the acute and chronic pain of chronic lumbosacral radiculopathy, cancer pain, phantom limb pain, pancreatic pain, and incisional pain. Epidural anesthesia can be used for surgeries such as cholecystectomy, coronary artery bypass grafting, hysterectomy, arthroplasty, or even abdominal aortic aneurysm repair. 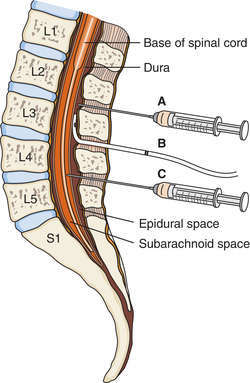 Epidural needles and catheters can be inserted at spinal levels C7 to T1 to treat patients with chronic pain symptoms or for surgeries of the arms and shoulders; from T4 to T5 for thoracic surgery; from T8 to T10 for upper abdominal surgery; and at L2 to L3 for lower abdominal surgery and labor and delivery. Drugs for epidural anesthesia include anesthetics such as lidocaine, analgesics such as morphine, or steroids such as methylprednisolone acetate. Epidural anesthesia is contraindicated in patients receiving systemic anticoagulation and antiplatelet therapy, e.g., aspirin products or NSAIDs, patients with abnormal or reduced concentrations of clotting factors, patients in hypovolemic shock, with abruptio placentae, and whenever there is evidence of active infection near the site of the insertion of the epidural catheter. Relative contraindications include history of headaches or backaches, chronic neurological disorders, and allergy to drugs being used. The anesthesia provider discusses the procedure, benefits, and risks with the patient and answers any questions. An informed consent form must be signed by the patient. The nurse may reinforce or clarify information as necessary and witness the patient’s signature on the consent form. Before the procedure the patient should have an IV line infusing lactated Ringer’s solution or 0.9% sodium chloride solution and should have supplemental oxygen via a nasal cannula or simple face mask. Blood pressure and oxygen saturation should be monitored throughout the procedure. The health care professional helps position the patient in the preferred sitting position with head down, shoulders slumped, and arms out in front to bend the back forward and open the vertebral spaces. Legs may be extended forward or hang over the side of the bed or table. If this position cannot be tolerated, the patient is positioned laterally with chin tucked against chest and knees in a fetal position. The patient is assisted to remain still and kept as comfortable as possible; reassurance and emotional support are provided. Once inserted, the epidural catheter is labeled according to the facility’s policy, and properly and prominently identified so that only epidural drugs are administered through it (these are pure, preservative-free medications, not the same formulation as for usual intravenous preparations of the same drug). The patient should then be assisted to a comfortable position or positioned for surgery. Administration of epidural medication and the removal of the catheter are determined by state nursing laws, which nurses must know. Epidural medications are usually administered by a certified registered nurse anesthetist or by an anesthesiologist and are managed by a staff nurse. Drugs given epidurally must be administered with a sterile technique. The dose is determined by the patient's response as the desired level of anesthesia is reached. The patient should be assessed periodically according to the facility’s policy. His blood pressure, heart rate, respiratory rate, and oxygen saturation should be documented. The insertion site and dressing are examined periodically for bleeding or medication leakage. The patient is assessed for pain from the catheter or from the infusion and for breakthrough pain related to the surgery or for the painful condition being managed. Continuous infusion via a pump or patient-controlled analgesia pump also must be checked for correct functioning. Muscle weakness and sensory loss may be indicators of epidural bleeding and nerve impingement, which requires emergency surgery to prevent permanent tissue and nerve damage. Any problems encountered should be called to the attention of the anesthesia provider. Hypotension is commonly experienced. The patient’s IV fluid infusion rate may need to be increased dramatically to manage hypotension, or a vasoactive agent may be administered as prescribed. Respiratory distress will occur if the needle or catheter enters the subarachnoid space, causing high spinal anesthesia with increased loss of respiratory muscle function. The anesthesia provider and rapid response team should be notified immediately, and basic life support guidelines followed to maintain airway, breathing, and cardiovascular status. The catheter may migrate into an epidural vein as a result of the patient's movement, causing epidural medication to enter the bloodstream and produce an overdose. Prevention of this complication involves slow, careful movement and repositioning by a caregiver team, with the patient providing minimal aid. If the dura mater is torn by the large needle or catheter during epidural insertion, a cerebrospinal fluid leak into the epidural space can occur. This complication should be suspected if the patient experiences severe and sudden headache when upright. The patient should be kept supine, the anesthesia provider notified, and the patient treated, which may involve administration of additional IV fluid, caffeine, analgesics, or an epidural blood patch. Infection is a rare complication: it is prevented by maintaining sterile technique throughout the insertion, management, and removal of the epidural device. Excessive sedation, hypotension, respiratory depression, and coma may occur if patients receiving epidural analgesia are also given other central nervous system depressant drugs. The use of hypnotic suggestion to alter a patient's perception of noxious sensations, e.g., the pain of childbirth or coronary artery disease. Anesthesia produced in a local area by injecting an anesthetic agent into operative sites or wounds. The introduction of pain-relieving drugs into the space between the visceral and parietal pleura, e.g., to relieve the pain of thoracotomy. It is also known, incorrectly, as intrapleural anesthesia. The injection of pain-relieving medications into the subarachnoid space. It is used to control severe pain, e.g., the pain of vertebral compression fracture or metastatic bone disease. Complete analgesia of an upper limb in conjunction with partial paralysis. A drug administration method that permits the patient to control the rate of drug delivery for the control of pain. It is usually accomplished by the use of an infusion pump. An adult or child who is cognitively and physically able to use the equipment and who understands that pressing a button can result in pain relief is an appropriate candidate to administer his own pain medications when they are needed. Safety is secured because opioid and opiate drugs, the analgesics most often administered by PCA, cause sedation before respiratory depression. A sedated patient will drop rather than push the PCA button, preventing delivery of more drug and respiratory concerns. This safeguard can be circumvented when some unauthorized person, well-meaning though that person may be, presses the PCA button for the patient. Health care professionals should advise patients, family members, and other visitors that the PCA should be used only by the patient. When patients are unable to use PCA appropriately, a family member or nurse may be authorized to manage the system. This primary pain manager must be taught how to assess for pain and its relief, using an appropriate method for the specific patient, and how to recognize and manage the adverse effects of opioids and opiates (nausea, vomiting, constipation, sedation, and respiratory depression). The manager also needs to know how to assess the patient’s sedation level using a sedation scale, such as the following: S = sleep, easy to arouse (awaken patient to determine arousability before administering a bolus); 1 = awake and alert (acceptable, may administer bolus); 2 = slightly drowsy, easily aroused (acceptable, may administer bolus); 3 = frequently drowsy, arousable, drifts off during conversation (unacceptable, notify primary nurse or health care provider); 4 = somnolent, minimal, or no response to physical stimulation (unacceptable, notify primary care provider immediately). In some cases, a secondary or even tertiary pain manager should be appointed for those times when the primary manager needs a respite. Nurse-activated dosing is appropriate for patients who have no family members who can manage pain and is useful in the intensive care unit, where the patient is usually critically ill. Health care agencies should develop criteria for selecting appropriate patients for PCA, family-controlled analgesia, and nurse-activated dosing. Patients, family members, and visitors should be taught about proper PCA use. If the patient’s pain appears to be unrelieved, the patient or concerned visitor should notify the patient’s primary nurse. Patients receiving PCA should be monitored at least every 2 hr for the first 24 hr, assessing vital signs, pain level, and sedation level. If sedation is at a level of 3, the opioid or opiate dose should be decreased and the basal infusion (if in use) stopped; monitoring should be increased until the sedation level is 2 or lower; and the patient’s or pain manager’s ability to manage the pain safely should be evaluated. If high sedation levels are found to be related to the inability to safely manage the pain using PCA, an alternative approach to pain management should be used. The injection of a pain-relieving drug, such as bupivacaine or lidocaine, around or near a nerve, to induce regional anesthesia. The administration of anesthetic before surgery in an attempt to abort postoperative pain and disability.